In two weeks, I will, for the first time in 5 months, wake up in the US. I knew that I’d feel a lot of things at the end of my semester, but I wasn’t really prepared to feel this underwhelmed/overwhelmed about going home. I mean, for starters, what the hell is “home”? My heart is divided into a bunch of little chunks – an endless supply of little pieces that I get to scatter. There is a chunk in Madison, and there always will be. There are pieces all over the twin cities. There’s a piece in Boston. There are pieces in Northern Wisconsin, where my family’s cabin was. Now there is a giant chunk in Oslo, with pieces in Bergen, in Stavanger, in Tromsø, on top of Preikestolen. This is a home. Norway is a home. So am I going home or leaving home? And if the answer is both, what happens to that chunk of my heart? I have all the faith in the world that Norway will take care of it, and that I can come back here someday. Maybe I’ll live here, practice Norwegian, work at a daycare or for the state, and eventually the US will feel like an old photograph that I take out to look at occasionally when I feel nostalgic. But more likely, at least for now, that’s what Norway will be. And that’s what scares me. I have a life here. I wasn’t just on vacation for 5 months, I lived here. How do you explain that life? I love so many people in the states so dearly, and I know that I can tell them all about my semester and they’ll listen and be excited for me, but ultimately, they just won’t get it. I can’t share the jordbær syltetøy at United Bakeries with them, I can’t take them to a kitchen party at Sogn, I can’t hike in Nordmarka with them or go on a skitur. So I have this semester and it’s going to sit inside me and I get to decide how I remember it. It’s my job to keep it alive, and not let my Norwegian life disappear. I’ve changed during this semester. I’ve become stronger. I learned a lot about who I am. I can communicate much better than I used to be able to. I ask for what I need. I take care of myself, and I better know how to do that. I continue to improve at being social, and also knowing when I need space for myself. I pushed myself. I learned a brand new language, and practice using it every day. I fell in love with nature in a way I hadn’t before. I learned the pure, simple joy of climbing on a rock, skiing up a hill, or sitting by a lake. I am determined to not lose the person I’ve become. This semester was a beautiful experience because of what I learned and how I grew. Because of all this growth, in a weird way, going back to Minneapolis seems like the worst sort of back-pedaling. I just experienced something amazing, something life-changing, and now I’m supposed to go back to the U of M and take required courses that only mildly interest me? Why? I know I need to finish my degree and do it at the U. I need to be an example for my younger sisters, who will be starting college in the fall. I need to complete that adventure, but I’m anxious. My head knows I need to, but my heart wants to keep moving forward. I think the next year will be a challenge in how to feel as though I’m moving even when my environment seems static, how to find the exciting in the familiar. I was told that I’d feel culture shock coming back to the States. I’m as ready as I can be. I will be working a summer job at a day camp that I love in Madison for two months when I get home. I think all I can do in my first months back in the states is feel as productive and important as I can – to feel like I’m making a difference. Keep moving forward. Keep growing. In these moments I remember the way I felt boarding my plane from Chicago to Oslo. I knew I was ready, but it almost felt like I was only ready because I needed to be- I was scared, but I made it. And I say all this now, two weeks before I go, because I won’t be blogging again until I get home. I need to really be here for these final days. I want to just take it all in, not process yet. I’ll have all summer to process. So, Oslo, takk for alt. Since I got back from travelling (which will be the subject of this post) I have been entertaining/hanging out with/talking to a friend from the U who was visiting me and writing a take-home exam for my Gender Equality in Nordic Countries course. This has left me with bare litt tid for blogging. From May 1st through May 7th, I was traveling. The itinerary? Dublin and Berlin. So what did I call it? Lin Week, selvfølgelig! I spent a week traveling alone. Before leaving, I was a little nervous about spending so much time by myself. I was afraid I wouldn’t meet cool people at my hostels, I was afraid I’d go days without having a conversation. It turned out to be a great experience — not only did I meet great people, but when I was by myself, I was calm in the solitude and just enjoying my surroundings. First stop was Dublin. I got in on Sunday, and spent the day walking around the city. Sunday night I checked into my hostel and met Aggie, a french woman who was on a trip from her study abroad term in Wales. She’s fluent in English and French (And mostly fluent in Spanish) and keeps a running list of all the French words commonly used in English. (I taught her about RSVP.) We went out for a beer and ended up spending Monday together as well. Tuesday and Wednesday were for wandering. I saw Phoenix park, Trinity College, the Guinness Storehouse, the Modern Art Museum, the Yeats exhibit at the public library, and a bunch of other fun sites. It was nice to be in a city that spoke English, and to be able to converse without feeling like I was missing out on something important. Early Thursday morning was my flight to Berlin. When I landed, I navigated the S-Bahn to my hostel, where I checked in and dropped off my stuff. I wandered around for a while, sleepier than I’d wanted to be, and decided I couldn’t handle any museums — I didn’t have the attention span to make it worth spending the money. I ended up on a street called Kurfürstendamm, or Ku’damm. Apparently it was celebrating it’s 125th birthday. There were a bunch of stations set up along the road with champagne and small pastries, and anyone with a gold wristband (I don’t even want to know how many euros they paid for those) could drink and eat as much as they wanted. While standing awkwardly amongst a giant crowd of people all slowly walking up the street, I overheard someone point to an important-looking man and say “Yeah, that’s the acting Mayor of Berlin.” I quickly snapped into tourist mode and took a picture of the Mayor, just as he was stopping to ceremoniously drink and toast to the street. And on Saturday I returned to Oslo. It’s incredible — each time I travel, coming back to Oslo feels more like coming back home. I’m not ready to think about what it will feel like to leave. IT’S OKAY TO PUSH MYSELF. I find that social situations often make me really anxious. Couldn’t tell you when it started, but it’s something I need to keep working on. Traveling alone forced me out of my comfort zone and into a world of meeting people and talking to strangers. I felt really proud of myself for saying “Yes” and pushing myself to hang out with all the great people I met that week. It wouldn’t have been the same place otherwise. WHEN I TALK ABOUT WE, SOMETIMES I MEAN NORWAY: During my travels, I’d often find myself comparing certain things (public transportation, eating habits, alcohol laws, etc.) with the people I met. When I gave my contribution, I was almost always talking about Norway. Over the past few months, I really have found a nice ownership/sense of belonging in this place. It’s a beautiful feeling, and one that I don’t want to give up quite yet. Påske (Easter) is quite the event in Norway. Tradition demands that you either read a crime novel or watch episodes of Crime TV every night. (They show them on the national public TV channel.) Stores close from Thursday through Monday. Bus routes shift. And, of course, you travel. My friend Aisha and I spent the week in West Norway. It was incredible and really nothing that I’d expected. Our first few days were spent in Bergen, staying with Ayla and Will (Aisha’s friends). I lucked out, because Will grew up in Duluth, and because he’s both fluent in Norwegian and Midwest, he was a great resource when conversation got too intense for me to follow. Bergen is a beautiful city and I would definitely consider spending more time there on my next Norwegian adventure. (If I say it definitively, that means it’ll totally come true, right???) Bergen highlight: climbing up to Fløyen and staring down into the city center and off at the mountains and water. Our next stop was Nedstrand, a tiny town right in a fjord, to stay with Hans Olav and his family. He and Aisha went to folkeskole together and I’ve been on a skiing adventure with him before. His family was incredibly nice, and cooked amazing food. It felt great to just relax in a home and be taken care of. Here was were I was introduced to the påskekrim — we spent our evenings watching British crime TV with Norwegian subtitles. After Nedstrand, our trip became a little more strange. Our next destination was Stavanger, but mostly so we could climb Preikestolen (Pulpit Rock). Because of Easter and the weird transportation schedules, we had no real way to get to and from the rock in one day, so we booked a night at the cabin near the rock. Climbing up and staring right down into a fjord was amazing, and I definitely am discovering/nurturing/indulging my new(ish) found love of nature and hiking. Most of the trail was essentially a scramble up a series of stones — challenge and oh so rewarding at the top. After our hike we got a fairly fancy dinner at the cabin restaurant and then promptly fell asleep. We were not supposed to spend a night in Stavanger. We were also not supposed to miss our bus the next morning. …Oops. When we learned that the next bus wasn’t until the next day (in that moment, I hated påske) we got a room at a hotel and spent the day exploring Stavanger. Stavanger high and lowlight: The oil museum. We didn’t go in, but we did explore the Geo Playground — a playground made entirely of recycled oil drilling equipment. It was a great idea, and a cool concept for recycling, but I felt funny about the oil industry very purposefully maintaining such a positive relationship with the community. It almost seemed too intentional. Oil and Norway is way more complex than I understand yet. So after our accidental night in the nicest hotel I’ll be staying in for a while, we took a 9 hour bus back to Oslo. All in all, it was a damn good påske week. NORWAY REALLY WAS MEANT FOR SMALLER CITIES. Bergen and Stavanger just kept making me think Wow, that’s so Norwegian! in a way that Oslo doesn’t. Don’t get me wrong, I love Oslo to death, but I think Norway really really does thrive in smaller cities. Norwegians like their space. Sometimes they seem to prefer having mountains for neighbors. It’s fascinating to live in the biggest city in this country and know that it would be considered a small/medium city by US standards. It’s also fascinating to feel drawn towards the smaller cities in Norway. Maybe I’m just having the pastoral dreams of an urban-raised kid, but maybe the beauty of Norway really is hidden in the small towns along the coasts. STUDYING ABROAD WILL INEVITABLY MAKE YOU ASK YOURSELF BIG SCARY QUESTIONS WITH NO ANSWERS. My friend Ben and I sat on my porch eating a delicious vegetable feast and drinking beer and talking about life. We both, during our semester abroad, have found ourselves questioning our lives in big monumental ways. The way he describes it “I think I’ve thought through everything from birth to now this semester”. I wonder about things. I suddenly feel so open to do anything, so anxious to be everywhere. My world just got a lot bigger, and that’s so exciting and so terrifying. Sometimes I have to remind myself to just get a kaffe and a bolle and enjoy the ride. I’m a slacker! I don’t know how it happened…Oh wait, that’s right, I had a Norwegian exam and I am busy traveling and existing in Norway as much as possible. First, the boring part: The test went well. I think I got an A. We’ll find out in a few uker. My sweet and amazing professor came up to me during the test and (totally illegally) reminded me about a particular Norwegian sentence structure that I always have trouble with. It was adorable and nice to see how much she really cared about my Norwegian success. Now that Norskkurs is over, I barely have any actual class-time left. I have a few exam papers coming up, but really, I’ve sort of entered my vacation in Norway time. I’m doing a lot of traveling in the next month, and I’m pretty excited about all of it. Which, of course, brings us to Amsterdam. That city is amazing and I love it. I did not love the Red Light District. I thought the novelty of it wore off pretty quickly, and I have a whole bunch of thoughts on the prostitution industry, but I am glad I saw the Red Light District. The part of the city that I absolutely adored was the south and southwest parts of Amsterdam. It was canals and bicycles and flowers and people who seemed like they immensely enjoyed living where they live. I could totally move there. I could learn Dutch, eat Stroopwaffels (amazing thin cookie-like waffels with caramel between them), and bike everywhere. I also really enjoyed having the opportunity to travel alone. This was the first time I’d ever done that, and while it felt a little lonely at times, I am beyond glad that I did it. I think I learned a lot about how I act/think/feel in different situations, and I learned how to spend time with myself, that I can and do enjoy spending time with myself. I also learned the value of starting a conversation with a stranger. Thursday night was finding my hostel, exploring the city, and walking through the Red Light District. Friday was TULIP DAY! I am totally my Father’s son. I can’t really help it. I get geeked out about fields of flowers. 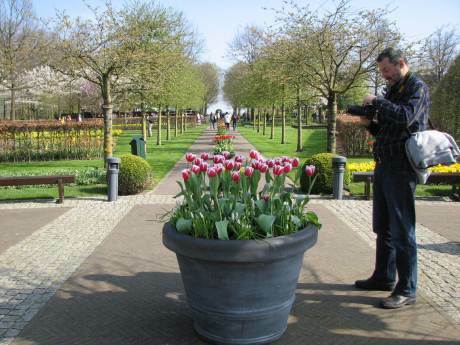 Friday morning, I boarded a bus with a bunch of people at least 10 years older than me and drove an hour west of Amsterdam to Lisse and into the Keukenhof Gardens. This place is famous for their tulips. The gardens were extremely well taken care of, and it was sort of like a display case of artfully-arranged flowers. I walked around for a while, laughed at the people straining to take the perfect photo, (spent a little time taking pictures myself), and enjoyed the beautiful weather. To contrast the condensed, amusement-park-like atmosphere of Keukenhof, I rented a BRIGHT ORANGE bicycle outside of the gardens and spent a few hours biking around Holland. 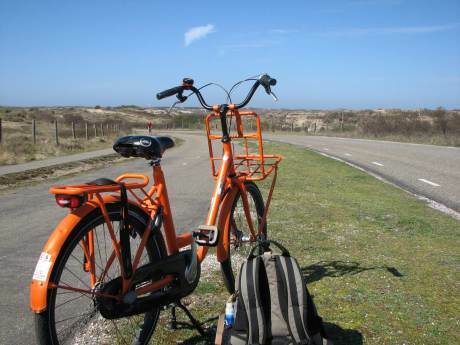 I rode through beautiful fields, sand dunes, and all the way to the sea. It felt so nice to get back onto a bicycle, and I’m glad that I can say I started this bike season off with a long ride through a beautiful country. Also, for dinner I had a pancake and a beer. Best thing ever. WHEN THE SKIERS GO INSIDE, THE RUNNERS APPEAR. Now that Oslo has thawed, everyone is out running. It’s beautiful (see: extremely hilly) to run near my student village, so I’ve been taking advantage of the spring weather as well. I said good-bye to me skis yesterday. There were no tears, but it was definitely rough. The running shoes and I have some good Norwegian times ahead of us. I NOW SEE PLASTIC BOTTLES IN TERMS OF THEIR RETURN VALUE. I don’t see size. I see kroner. In Norway, you can return plastic pop bottles and aluminum cans to grocery stores and get a little money back. Whenever I want to describe the size of a bottle, the first thing I think is “you know, a 1 krone bottle” or “One of those huge 2.5 kroner bottles”. Oh, Oslo. I blinked and now it’s spring. How did that happen? Because of this, I have been extra-pleasantly surprised by the arrival of spring (save an inherent sadness as I stare longingly at my skis). I know that Oslo is still set to have some cold days and probably a little more snow, but now that it’s made a this short appearance, spring has announced that it’s moving in. I’m excited to witness a greener, warmer Norway. I DON’T NEED TO AGREE. I am getting much better at sitting comfortably in a room with people who I disagree with. Maybe they’re just people I’m at a party with. Maybe they’re my friends. Doesn’t matter. I’m learning that I don’t need to agree with everyone, and having different opinions/morals/etc doesn’t necessarily rule out a friendship. I think they mentioned something about this in Kindergarten. I guess it takes a while for that sort of thing to sink in. WALKS TO SCHOOL SHOULD ALWAYS BE 80% WALK, 20% DANCE. ‘Nuff said. For the last few Sundays, a few of my friends and I, occasionally calling ourselves Team Applesin (Orange på norsk), have been spending our afternoons cross country skiing. Having never skied before coming to Oslo, I quickly fell for the sport, and have thoroughly enjoyed spending my time experiencing Norway on skis. The silence. A couple Sundays ago, we were skiing up near Sognsvann, and all three of us paused for a moment. That day, the trail had been filled with Norwegians carrying radios in their backpacks listening to the Nordic World Championships, but we had managed to find an empty space. Surrounded by trees, trying not to think about all the hills we had gone up, for a brief moment I heard absolutely nothing. Silence in the forests of Oslo is a silence I hope to hold onto for a long time. Feeling Norwegian. I’ll never be Norwegian but connecting with Oslo on skis makes me feel close to this place in a way I can only assume Norwegians feel close to Norway. I am seeing more than Museums, than my campus—I really am seeing Norway. A Norway slightly less touched than downtown Oslo. Even though they may seem like simple afternoons spent skiing, I am keeping these moments as the times I felt truly connected to Norway and my experience here. Kvikk Lunsj, duh. Meet Kvikk Lunsj: a Freia company chocolate bar that’s basically a Kit-Kat. They seem to be doing an incredible job at marketing themselves as the Athlete’s Candybar. The wrappers have stories of different skiers and they were huge sponsors of the World Championships. (There was a vending machine at the T-bane station near my flat that converted to entirely Kvikk Lunsj for the week. It was amazing.) We take a break mid-skitour every time to eat a snack. Typically it involves hot chocolate, fruit of some sort, and chocolate- usually Kvikk Lunsj. Giving in to the challenge. I’m not a very skilled skier. I fall a lot. Maybe it’s cross-country skiing, or maybe it’s just the state of being I’ve found myself in lately, but whatever the reason, every time I fall, I laugh. I brush it off. I smile. Skiing is fun. I may have just fallen, but I’m still having fun. It’s a challenge. I silently applaud myself when I make it down hills without falling. I try not to fight it- fighting the challenge only makes it harder. Give in and smile. It’s way more fun. OPPRESSION IS HARD TO TALK ABOUT, SO WE SHOULD TALK ABOUT IT A LOT. This, after a little ode to skiing, probably seems super sadsack and liberal affluent white kid of me to talk about. But here’s what happened: I’m in my Gender Equality class, and the teacher mentions something about Men being oppressed for their gender. I say “You know, as far as I’ve learned it, based on the definition of Oppression as being something one can only experience if you aren’t the group with power and privilege, I would have to say that Men, solely based on gender, can never be oppressed.” A person in the class (A man) says “That’s absurd!” and begins to tell me that I can’t say that men can never be oppressed. Part of the issue was clearly that he misunderstood or didn’t care that I had said I was only talking about gender oppression, but still, a phrase that stuck out to me in the worst way was “when oppression goes both ways.” Um, what? Oppression, by definition, can’t go both ways. That’s not how it works. Power means you can’t be oppressed in that specific situation. Other people in the class also seemed to think I was a little off-base or just plain ol’ wrong. It felt like trying to fist-fight a brick wall. Part of it could have, admittedly, been a language barrier, but I think most of it is just proof that we as human beings aren’t talking about this stuff enough. Men, in most cultures, don’t face Sexism. The systems are working for them. If we ever want to change it, we need to first learn how to talk about it. AFTER CLASSES LIKE THAT, YOGA RULES. All I needed was to deep breath that all out. Somedays you can only fight the brick wall for so long before you need to retreat and try again later. On that note, Happy International Women’s Day. A thousand thanks to all the women who are and have been a part of my life. In honor of my friend Caitlin’s Spring Break, I skipped off to Göteborg, Sweden for a couple days with her and our friend Melinda. Loved the State Museum. Got a half-price Italian meal—ordered a glass of wine like a fancy-pants. Went Thrift-Store shopping (brand new red belt!). Fell in love with Lidl grocery stores and their cheap prices. Stayed at a hostel and snuck 3 people into a 2-person room. The world's only stuffed blue whale. Basically, I had the best time. It was nice to just spend some time being in another city. Oslo is fun, and each time I return from a trip I feel more and more like I’m coming home to Oslo, but I am also enjoying my Scandinavian adventures outside of Oslo. Which sort of brings me to my point. I’ve been abroad for about a month and a half now, and I’m starting to wonder why I’m here. Not in an arms-outstretched, screaming to the heavens sort of way—I just want to know what I truly want out of my experience. When I come back home, and people ask me about my semester abroad, what will I want to tell them? Is it important to me to party every weekend, or is it important to me that I continue to write as much poetry as I write in the states? Do I want to ski on Sundays, or run around the city center? Do I want to travel around Europe, or do I want to stay in Norway the whole semester? (Yes, I know that the aforementioned trip to Sweden makes the latter option impossible at this point…) Do I want to try to eat out at every restaurant in Oslo, or do I want to keep cooking? Should I buy fancy bread, or make my own like I sometimes do in Minneapolis? I try to keep all of these questions in mind as I make decisions about how I spend my time. I know I won’t be disappointed by my Norway experience, but I want to be as un-disappointed as possible, you know? I don’t really have the answers yet. I try to just trust my gut. I think that, as cheesy as it sounds, if I keep my one goal to be my truest self as often as possible, I’ll most certainly have the best experience that I can. DADS RULE IN SCANDINAVIA. And by that I mean, they act like Dads. All the time. At the State Museum in Göteborg, I walked into the children’s area, and saw a roomful of small children and fathers. All sorts of fathers playing with their children. In my Gender Equality class, we’ve touched in the equality between parents in the Nordic Countries, but it was quite a gift to get to witness it. If I ever have children, that’s the sort of father I want to be—the kind that is an equal partner in the world of raising children. This was a shorter post. Maybe I’m actually getting better at not rambling? Doubt it! I think I’m in my second “too much input, no way to output” phase. It’s as if I’m cracking through to the second layer of life in Oslo, and I don’t know enough to comment yet. Oh, and Wisconsin continues to fight. My mom keeps me updated regularly. I’m sending so many positive vibes towards Madison.